With high pressure finally settling over the UK during the past week those spring migrants held up by the recent northerlies have finally begun to arrive. Brandon Marsh has been a cacophony of sound with many Chiffchaffs, Willow Warblers and Blackcap. Sand Martins are already in and out of the artificial structure and Swallows are now in good numbers. 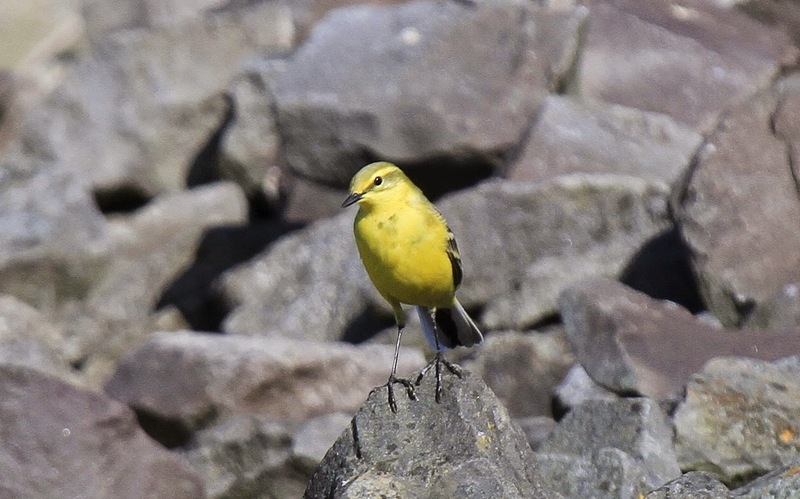 On Monday I decided to start my day at Draycote Water but after registering my first Yellow Wagtails of the year and catching up with the recent Little Gull I abandoned my visit due to the sheer numbers of black fly. On to Brandon Marsh where the highlight was three White Wagtail on East Marsh Pool. Tuesdays visit to Brandon had my first ♀Blackcap, a fly-by Cuckoo and at least three Sedge Warbler. The mid morning sunshine had brought out a good number of butterflies, including a couple of years firsts, Green-vein White and a half dozen Orange-tip. A stop off on the way home at Napton Reservoir had four Yellow Wagtails before I got fed up with the several dog walkers chucking sticks into the water. Thursday is work party day at Brandon Marsh but I arrived just after sunrise and took a tour of the farm pool and top reedbeds before work. I was quite surprised that during my tour I didn't come across a single Sedge or Reed Warbler and over recent years this has also been a great spot for my first Grasshopper Warbler of the year. As it turned out I was on the wrong side of the reserve! When I reached East Marsh Hide for coffee news of Reed Warbler and Grasshopper Warbler near the 'Olive Bench' from the chaps had me on my way and sure enough a reeling Gropper and at least two Reed Warbler from the bench area. A Cuckoo was also calling from the golf course and back at the hide my first Common Sandpipers. While working on the conservation area at least two Common Whitethroats were new to the reserve, a single Snipe and two Little-ringed Plover were also recorded. During lunch a phone call from Richard Mays instantly turned me green with news of Montague's Harrier and Whinchat on my doorstep at the nearby Napton Reservoir. Fortunately I managed to connect with the stunning ♂Whinchat when I dropped in on the way home. Tree Pipit also heard during my stay. Sadly my dreams of a Montague's Harrier perched on my roof when I arrived back aboard didn't come to fruition! Record shots on Richards blog.